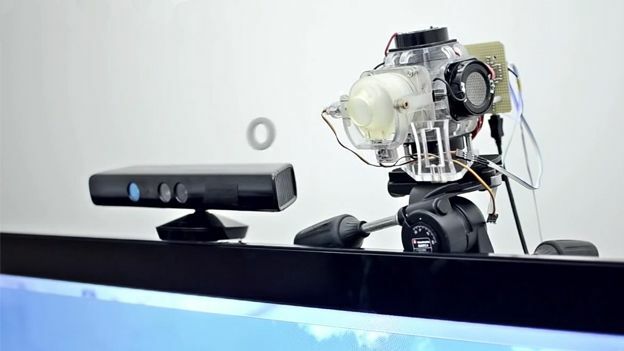 Disney Aireal is a low cost 3D printed haptic feedback controller that the company is hoping will become integrated into the next-generation of handsfree controllers like the Xbox Kinect and the PlayStation Eye. Developed by Disney Research the Aireal is almost entirely 3D printed making it extremely low cost. Once built and hooked up to their software it can create a tiny vortex which can then be aimed and fired at the player creating the illusion of touch. In a video showreel Disney paired the Aireal with an Xbox Kinect to show how a person could hit footballs on a screen using their hand. Kinect would register the impact and Aireal would then fire a vortex at your hand creating the illusion that you'd actually hit it. Disney also hooked up the Aireal to an Apple iPad showing how a person could scroll through iTunes using haptic feedback as a control mechanism. Last but not least the company showed how it could be used in the real-world showing how a projection of a butterfly on a real leaf could become more realistic as the Aireal moved the leaf in time with the wings. Microsoft recently unveiled their Illumiroom concept, a projector-based peripheral which would fill the space around your TV with the rest of the gaming environment. With next-generation gaming technologies like the Oculus Rift capturing public imagination it wouldn't be too big a leap to say we may well be seeing similar tech heading to the games consoles of the future.